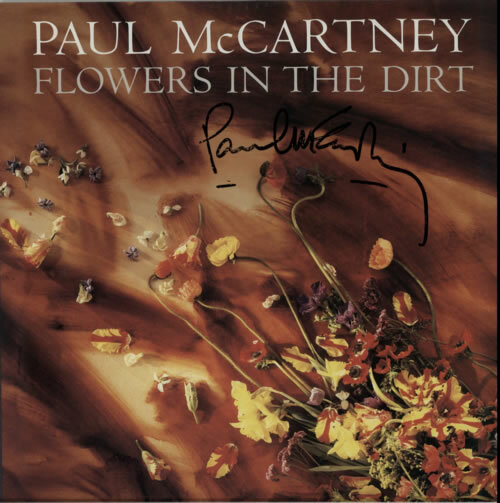 PAUL MCCARTNEY Flowers In The Dirt (Very rare 1989 French promotional-only press kit, comprising the French edition of the 12-track LP [#7916531], with yellow/credit inners & an autographed picture sleeve - the front cover signedby Macca in black marker pen - an exclusive 4-track CD sampler with 7-page French press release housed in an 11" square album artwork folder, a colour poster banner of the album artwork, a folded colour pamphlet listing the radio/TV/press tour dates & two pages of journalist notes from a radio playback session. The whole thing is stored in a custom 14" square album artwork folder, obtained from the former programme director of RTL radio. The outer folder exhibits some creasing, scuffing & a small edge split from use at the events, yet all contents are well kept & close to near mint. We're unlikely to ever find one of these again! ).